Russian Circles have always been a step above the others in the post-rock/post-metal/post-whatever pantheon. More interested in dynamics than in the slow build and burn of their brethren, Russian Circles’ particular brand of instrumental rock has always been more immediate and more driving than those of most bands of their ilk. Their sixth album, Guidance, showcases the band as veterans and masters of their crafts–guitarist Mike Sullivan is still a riff monster, bassist Brian Cook is the steady anchor and drummer Dave Turncrantz is the maniac steering the ship. 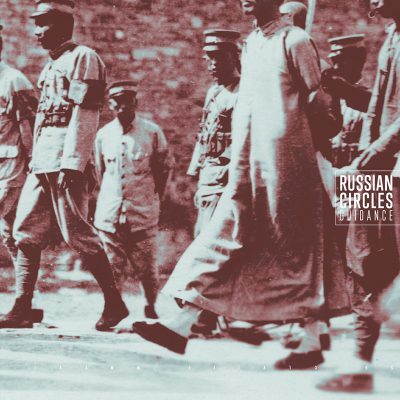 Now that Russian Circles are veterans, however, it allows them to dip into those oft abused post-rock tropes and reinvent them within their own context, resulting in an album that showcases a new side to the band while still delivering the intensity and quality that fans will expect. The album begins in an atypically somber manner with “Asa,” featuring delicate guitarwork from Sullivan and not much else—some sort of background buzzing and the most minimal amount of drumming on a Russian Circles song (probably ever) make it feel more in line with the likes of Explosions in the Sky. After four minutes, the song slowly morphs into “Vorel” on top of Turncratz’s drums, with Sullivan and Cook exploding forward with the driving, crushing energy that Russian Circles are known for. The opening pair of tracks reintroduces the concept of the post-rock crescendo in an interesting manner, starting softly yet building quickly and maintaining the same sense of energy rather than plummeting from a peak of intensity. “Mota” is another example of Russian Circles expanding their sound within their own framework, opening again with a bit of a softer and more sparse sound (it almost sounds like one of the quieter parts of Isis’ Oceanic), yet Turncratz’s drums firmly propel the song forward. Nearly three minutes in, Cook jumps in with a sinister bass tone reminiscent of “Mládek” from the band’s 2011 album, Empros, signalling the arrival of the song’s heavier side.